KP: How did the two of you come together on this project? KP: So you had already felt each other out and knew you could work together. KP: Did you start off thinking ‘I’m going to be a collector’ or was it more like… osmosis? KP: I’m sorry… you own that? Rooney: Paul Bern [her soon-to-be second husband] was with her that night, yes. And this is probably the only document, outside of their marriage certificate that has both their names on it. Luckily for fans: this is also going to be part of the Harlow Exhibit. Rooney: Well, that ledger was also exhibited at a Thalberg exhibition at the Academy of Motion Picture Arts and Sciences in 2009. Mark was guest curator. KP: And Jean Harlow too for her young years, was a consummate professional. Rooney: She was very democratic on the set. She really related to the crew, a lot of which had to do with her upbringing. As a child she was friends with the people who worked for her family; maids, cooks, yard-hands, etc. KP: In order to tell a story with images you have to make tough decisions. For someone with a collection like yours, it must have been murder. KP: How many photos in the book are previously unpublished? KP: But your first interest was in filmmaking? KP: And you’ve been here ever since? KP: Speaking of: one of the key things that sets this book apart from Stenn’s is the fact you call don’t call Jean’s mother “Mama Jean,” you call her by her rightful married name: Jean Bello. 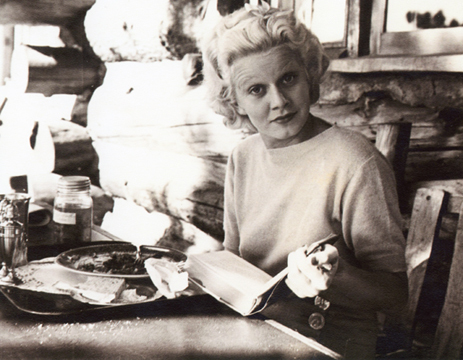 For any unfamiliar with the Jean Harlow/Mother Jean thread of the Harlow story, Jean Harlow was the maiden name of the Mother. A beautiful, intelligent woman whose acting aspirations were thwarted by a forced marriage. Those ambitions were then channeled through her only daughter Harlean who, upon entering the movies took her mother’s name as her own screen name: Jean Harlow. What resulted was psychological symbiosis, leaving the daughter without any true identity of her own. KP: Stenn’s biography obviously uses the ‘Mother Jean’ phrase to drive home a point, but by calling Jean’s mother by her rightful married name, Jean Bello, it gives Harlean back at least some of her identity. Rooney: Mark is very definitely, scholarly so he brings the reasoning of a scholar to these things. KP: By many accounts she was a rather difficult woman to like. KP: The notes they sent back and forth to each other on Mothers Day… almost frightening in a way. KP: It’s a mother/daughter story that guts me every time. KP: And it handicapped her emotionally. You bring this out in the book: she was not emotionally mature enough to carry on a relationship. KP: Or date someone like William Powell. KP: You mentioned Paul Bern, which reminds me of the mural he commissioned– that Renaissance banquet table seated with his closest friends in period dress. It’s a really important find that is featured prominently in the book. KP: It’s such an odd, whimsical piece. The Paul Bern subject is a weighty one. His gruesome suicide only two months into his marriage with Harlow led to decades of misinformation and sensationalized speculation. KP: How did you meet the owners of the car? KP: So the Packard is the centerpiece of the exhibit? Vieira: Yes, when the Max Factor Salon opened in November 1935 there were three separate rooms: the Blonde Room, the Brunette Room and the Red-head Room. A movie star of each persuasion officially ‘opened’ each room and was photographed cutting the ribbon alongside Mr. Factor. Claudette Colbert opened the ‘Brunette Room’ and Jean Harlow opened the ‘Blonde Room’ and for the first time showed her real honey blonde hair in public. Vieira: And something else that doesn’t show up in the text of the new book is the riot that occurred there. Vieira: Yeah, there was a riot at the Opening that night. And a famous western star—I haven’t been able to find out which one—but the L.A. Times ran a blind item about a western star who got so drunk at the Max Factor Studio party that he had to be ejected. I guess it could’ve have been Tom Mix. KP: So tell us: why this book? Why now? 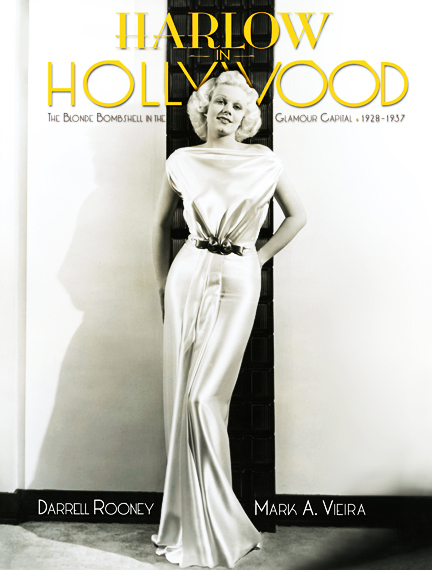 ‘Harlow in Hollywood: The Blonde Bombshell in the Glamour Capital, 1928-1937’ hits bookshelves March 1st. Pre-order your copy now at Angel City Press or Amazon.com. 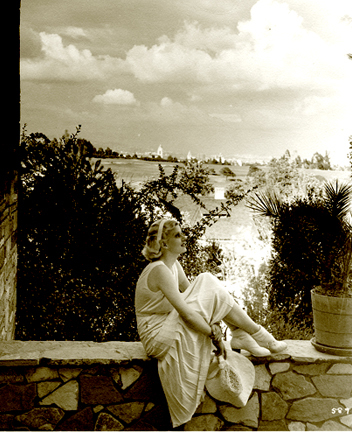 Visit The Hollywood Museum in the Historic Max Factor Building or thehollywoodmuseum.com for upcoming details on the exciting new Jean Harlow Exhibit, opening March 3rd, 2011. The Blonde Bombshell Centenary Bash! Thanks Kitty for this great interview of Darrell Rooney and Mark Vieira. This sounds like a great book and a fascinating story. And with the combined talents of the authors, a high quality production. Your interview captured the really fascinating background story. To say that I’m really looking forward to this book would be an understatement — anything that helps clarify the Harlow legacy is something I approve. Not only was she an icon as an actress, but an admirable person. As a longtime fan of Jean’s close friend Carole Lombard — someone who shared many of Harlow’s beloved qualities — I would love to someday create a similar book about her. Great interview! This books looks fantastic and I can’t wait to look at and read it! Thanks *so* much! That really means a lot, coming from you! I admire your work over at Viv and Larry so very much! Excellent interview! I always wondered what happened to the Grand Hotel premiere ledger because I always thought that would be one of the greatest pieces of Hollywood memorabilia to own. Glad to know it still exists! Congratulations on an outstanding interview! You were able to draw out from the authors so many of the various elements of their creative process and collaboration to produce this new work. Definitely makes the book much more desireable than I would have imagined. It’s fortunate that a collector with an amazing trove of Harlow artifacts teamed up with a first rate historian to produce a book that may provide a balance of great images and factual research (and since they know David Stenn, its not likely they’ve just remade his book with a few previously unpublished photographs). I honestly had no desire to read more about Harlow than I already have, having figured that such a short life of 26 years — with only 8 or so in the public eye and dead for 70-plus years — had been thoroughly mined and exhausted. But in her case, it’s seems a backstory without end. Again, thanks for the interview with the authors — its unlikely that anything as thorough and detailed will be seen in other media outlets. I just watched Libeled Lady for the first time yesterday. I spent the rest of the evening researching Jean Harlow and was utterly fascinated. What a lot of life was packed in those few years she was given. I look forward to reading Darrell and Mark’s book. Thank you for the interview. By all means read the book “Bombshell” by David Stenn (1993). It was the first (and maybe still the only) effort to research/investigate Harlow’s life in detail. Luckily, Mr. Stenn was able to find and interview many people still alive who had first hand knowledge of her early life and later her illness, hospitalization and tragic, but at the time unpreventable, death.